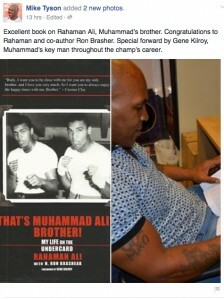 Former Undisputed World Heavyweight Champion, Iron Mike Tyson Promoted – That’s Muhammad Ali’s Brother! – on his Facebook Page! Rahaman Ali and Ron Brashear’s book, That’s Muhammad Ali’s Brother! – My Life on the Undercard, received a recommendation from one of the greatest boxers to ever enter the ring, Mike Tyson! Champ, as many affectionately refer to him, shared the latest book he was reading with his 4 million followers on Facebook late last night, generating quite a buzz about the book. Congratulations Rahaman and Ron for catching the eye of Iron Mike Tyson! Like and share the post by following this link to Mike Tyson’s Facebook Page. Get your copy today from bookstores everywhere or online by following this link.